Growing up Jewish on Manhattan’s Upper West Side wasn’t novel in the 1960s, but the Syrian cuisine we ate in my home was certainly unique. Most people are unaware of the community my family belongs to–the relatively small Syrian Jewish population that resides primarily in Brooklyn’s Ocean Parkway. Raised in Manhattan, I was somewhat disconnected from the Syrian scene; even so, we attended many celebratory get-togethers in Brooklyn, and those parties made a lasting impression on me: the sounds of Arabic mixed with Hebrew; the smells of cumin and allspice, rosewater and almonds; the richly colored fruit, poured over meat dishes; bright yellow squash served with salty white cheese; candied fruit rinds and powder-dusted pastries. My great-grandmother, whom we called Steta (only in my twenties did I learn that Steta is an Arabic term of endearment for “grandmother”; Steta’s real name was Esther) came to America in 1924. 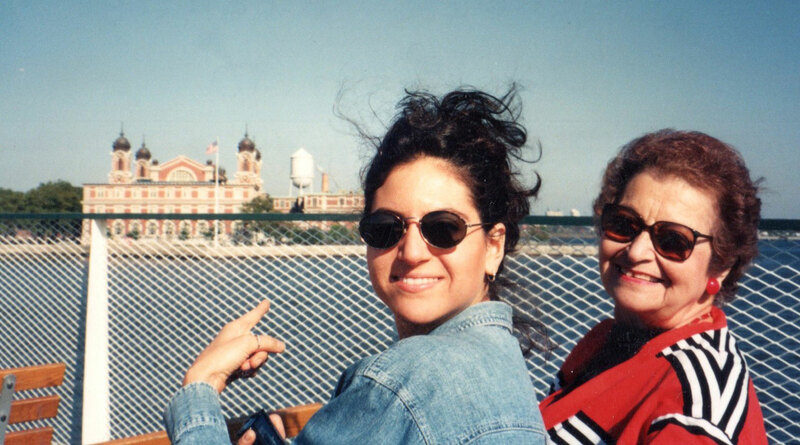 Armed with her native knowledge of Syrian specialties, Steta continued to cook and bake in her Brooklyn kitchen much as she had in Aleppo, except that (God bless America!) she now had her own oven and didn’t have to share a communal kitchen. One of my fondest memories is of Grandma Esther imploring us, in heavily accented English, to go back to the table for second and third helpings. collection of Syrian recipes for a cookbook. 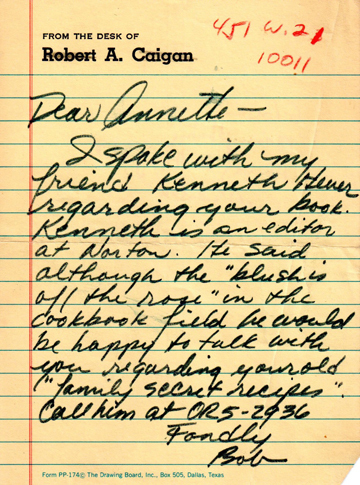 In the 1970s, my mother, Annette, and my Aunt Essie decided to collect my great-grandmother’s recipes. Carefully observing Esther in the kitchen and eking out as many Old World secrets as they could, they gathered a substantial number of recipes. The result of their work–a three-ring binder that at times sat on shelves in each of their homes–provided us with many successful Syrian dinner parties. Thirty years later, I decided to host my own Syrian dinner party. Flipping through the pages of their recipe collection, I realized that although much of the groundwork had been laid, the recipes weren’t complete. Ingredients were sometimes missing; measurements were often vague; directions weren’t always clear. Holding the binder in my hands, thinking about the importance of tradition and the ease with which Old World knowledge is lost, I decided to make this project my own. Where my mother and aunt had left off, I would begin anew. As my mother and aunt had once done with their grandmother, I decided that I, too, wanted the experience of learning the traditional Syrian way of cooking from my own direct source—Grandma Fritzie. first official point of immigration to America. As I began to spend time in my Grandma Fritzie’s kitchen, I realized how important cooking was to her and to her cultural world. 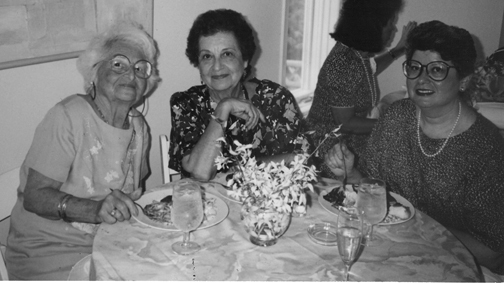 In my grandmother’s day, Syrian-American women made their mark through their culinary achievements. Bringing their own skills to the recipes of their mothers was a way to work within the bounds of tradition and simultaneously express their individuality. Cooking was also an exchange with their community; it meant going to the market, chatting with other women, and planning big events. For women who often were not employed outside the home and usually had not attended school, cooking’s importance could not be overstated. My grandmother, though excited about my cookbook idea, was not so eager to give up the secrets that made her dishes so special. Her art had been passed down and guarded by the maternal line for generations. If she allowed me to divulge the family’s secrets to outsiders–then what? in Grandma Fritzie’s own handwriting. Good Syrian cooking does not flow easily down the maternal line. 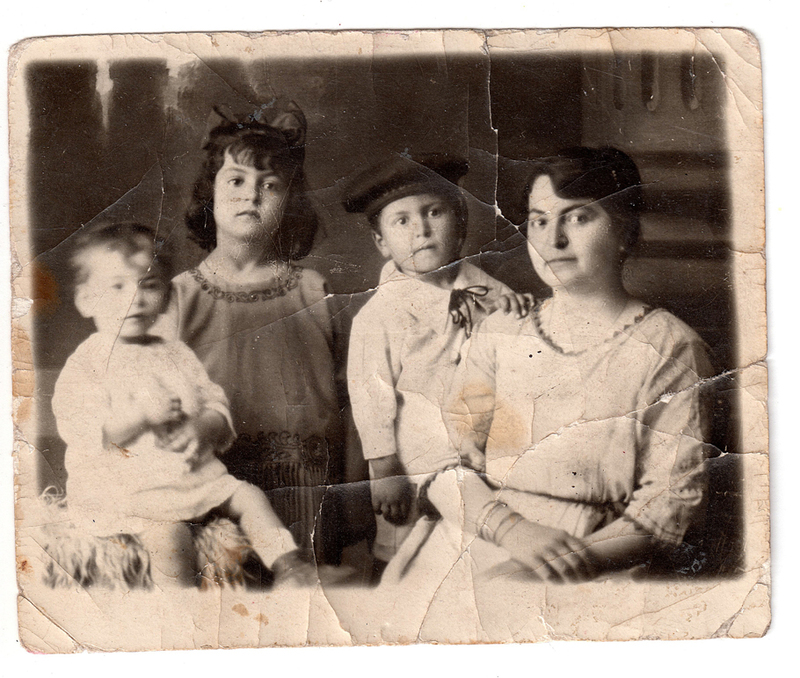 My mother remembers a visit she and her sister Essie made to Esther’s home for a day. They tried to help her with the baking–preparing sambussak, a dough pastry filled with cheese. When Esther looked at some of my mother and aunt’s pastries, she roared, “Who made these?” It was a long time before my mother or aunt tried their hands at these pastries again. The first Syrian meal my mother cooked all by herself was at a party celebrating her engagement to my father, Harold. The guests had arrived; the pots were simmering on the stove. Just before serving, my mother went to taste all of the dishes for a last-minute salting and spicing. Every dish was much saltier than she remembered. Suspicious, she pulled Grandma Fritzie aside and asked her if she had done something. 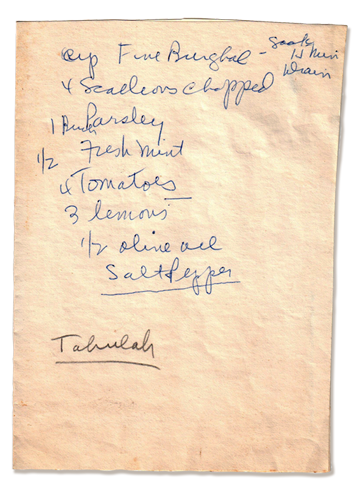 Grandma Fritzie replied that she’d only added salt where she thought the dish “needed adjusting.” To this day, my mother is convinced that on some level my grandmother was attempting to sabotage her daughter’s first dinner party, although Grandma says she was only trying to “help” with her daughter’s debut. My interpretation is that Grandma Fritzie didn’t think my mother was ready for prime time (after all, she wasn’t even married yet!). Even after my mother was married, she still allowed Grandma Fritzie to cook for a number of dinner parties before striking out on her own. Despite the intergenerational competition, young women always managed to become expert cooks. Though they might have stumbled at the beginning and suffered the criticism of their mothers and grandmothers, when they finally achieved success they were warmly welcomed into the “girl’s club” of the Syrian community. Through my own experiences of cooking with my grandmother, I learned more than I had ever imagined. Now I fully appreciate that cooking represents so much more than a pleasurable meal. It confirms a tradition maintained for hundreds of years, linking one generation to the next; it is an impetus for families to gather, celebrate, and share their everyday life. It creates a sense of belonging within a community. As the writing of this book progressed, I sometimes shared my grandmother’s worry: When other people learn these recipes, cherished secrets of my family and of the Syrian-Jewish community as a whole, will the specialness of the dishes be lost? But the truth is that this book is more than just a cookbook. It is a tribute to all of the women in my family, past, present, and future. And, of course, both men and women can learn from the traditional world of cooking, so this book is a gift to all members of my family and all people in the generations to come. Ena b’habek tir. I love you, Grandma Fritzie. And to my readers, It’fadalu. Welcome to our table. And your story about how it came to be is so lovely, warm, and sweet. Thanks for sharing your family memories, traditions and foods with us. I just bought a copy of your cookbook and am already in love. I had turnips in my fridge from the garden wondering what to do with them because pass attempts at cooking them have been only so so, fried them tonight and they were so delicious. Really looking forward to trying all the recipes!!! Hi Tanzi, Thank you for purchasing my cookbook! I am glad that you like the turnips recipe. This is a great time for cooking up all kinds of root vegetables, and it’s very healthy and satisfying during the cold winter months.